Many customers are choosing to build event-driven applications in which subscriber services automatically perform work in response to events triggered by publisher services. This architectural pattern can make services more reusable, interoperable, and scalable. Customers often fork event processing into pipelines that address common event handling requirements, such as event storage, backup, search, analytics, or replay. To help you build event-driven applications even faster, AWS introduces Event Fork Pipelines, a collection of open-source event handling pipelines that you can subscribe to Amazon SNS topics in your AWS account. Event Fork Pipelines is a suite of open-source nested applications, based on the AWS Serverless Application Model (AWS SAM). You can deploy it directly from the AWS Serverless Application Repository into your AWS account. Event Fork Pipelines is built on top of serverless services, including Amazon SNS, Amazon SQS, and AWS Lambda. These services provide serverless building blocks that help you build fully managed, highly available, and scalable event-driven platforms. Lambda enables you to build event-driven microservices as serverless functions. SNS and SQS provide serverless topics and queues for integrating these microservices and other distributed systems in your architecture. These building blocks are at the core of the modern application development best practices. At scale, event-driven architectures often require a set of supporting services to address common requirements such as system auditability, data discoverability, compliance, business insights, and disaster recovery. Translated to AWS, customers often connect event-driven applications to services such as Amazon S3 for event storage and backup, and to Amazon Elasticsearch Service for event search and analytics. Also, customers often implement an event replay mechanism to recover from failure modes in their applications. AWS created Event Fork Pipelines to encapsulate these common requirements, reducing the amount of effort required for you to connect your event-driven architectures to these supporting AWS services. AWS then started sharing this pattern more broadly, so more customers could benefit. At the 2018 AWS re:Invent conference in Las Vegas, Amazon CTO Werner Vogels announced the launch of nested applications in his keynote. Werner shared the Event Fork Pipelines pattern with the audience as an example of common application logic that had been encapsulated as a set of nested applications. Each pipeline is subscribed to the same SNS topic, and can process events in parallel as these events are published to the topic. Each pipeline is independent and can set its own subscription filter policy. That way, it processes only the subset of events that it’s interested in, rather than all events published to the topic. The three event fork pipelines are placed alongside your regular event processing pipelines, which are potentially already subscribed to your SNS topic. Therefore, you don’t have to change any portion of your current message publisher to take advantage of Event Fork Pipelines in your existing workloads. The following sections describe these pipelines and how to deploy them in your system architecture. In the abstract, Event Fork Pipelines is a serverless design pattern. Concretely, Event Fork Pipelines is also a suite of nested serverless applications, based on AWS SAM. You deploy the nested applications directly from the AWS Serverless Application Repository to your AWS account, to enrich your event-driven platforms. You can deploy them individually in your architecture, as needed. Here’s more information about each nested application in the Event Fork Pipelines suite. You can configure this pipeline to fine-tune the behavior of your delivery stream. For example, you can configure your pipeline so that the underlying delivery stream buffers, transforms, and compresses your events before loading them into the bucket. As events are loaded, you can use Amazon Athena to query the bucket using standard SQL queries. Also, you can configure the pipeline to either reuse an existing S3 bucket or create a new one for you. You can configure this pipeline to fine-tune your delivery stream in terms of event buffering, transformation and compression. You can also decide whether the pipeline should reuse an existing Amazon ES domain in your AWS account or create a new one for you. As events are indexed in the search domain, you can use Kibana to run analytics on your events and update visual dashboards in real time. By default, the replay function is disabled, which means it isn’t redriving your events. If the events need to be reprocessed, your operators must enable the replay function. This is how everything comes together. The following scenario describes an event-driven, serverless ecommerce application that uses the Event Fork Pipelines pattern. This example ecommerce application is available in AWS Serverless Application Repository. You can deploy it to your AWS account using the Lambda console, test it, and look at its source code in GitHub. Backing up all orders securely. Compressed backups must be encrypted at rest, with sensitive payment details removed for security and compliance purposes. Searching and running analytics on orders, if the amount is $100 or more. Analytics are needed for key ecommerce metrics, such as average ticket size, average shipping time, most popular products, and preferred payment options. Replaying recent orders. If the fulfillment process is disrupted at any point, you should be able to replay the most recent orders from up to two weeks. This is a key requirement that guarantees the continuity of the ecommerce business. This CMK is managed by AWS and powered by AWS Key Management Service (AWS KMS). For more information, see Choosing Amazon S3 for Your Destination, Data Transformation, and Configuration Settings in the Amazon Kinesis Data Firehose Developer Guide. For more information, see Choosing Amazon ES for Your Destination, in the Amazon Kinesis Data Firehose Developer Guide. The Event Replay pipeline is configured with the SQS queue name that is part of the regular checkout processing pipeline. For more information, see Queue Name and URL in the Amazon SQS Developer Guide. The filter policy, shown in JSON format, is set in the configuration for the Event Search & Analytics pipeline. This filter policy matches only incoming orders in which the total amount is $100 or more. For more information, see Message Filtering in the Amazon SNS Developer Guide. By using the Event Fork Pipelines pattern, you avoid the development overhead associated with coding undifferentiated logic for handling events. Event Fork Pipelines can be deployed directly from AWS Serverless Application Repository into your AWS account. Event Fork Pipelines is available as a set of public apps in the AWS Serverless Application Repository (to find the apps, select the ‘Show apps that create custom IAM roles or resource policies’ check box under the search bar). It can be deployed and tested manually via the Lambda console. In a production scenario, we recommend embedding fork pipelines within the AWS SAM template of your overall application. The nested applications feature enables you to do this by adding an AWS::Serverless::Application resource to your AWS SAM template. The resource references the ApplicationId and SemanticVersion values of the application to nest. # SNS topic ARN whose messages should be backed up to the S3 bucket. When specifying parameter values, you can use AWS CloudFormation intrinsic functions to reference other resources in your template. In the preceding example, the TopicArn parameter is filled in by referencing an AWS::SNS::Topic called MySNSTopic, defined elsewhere in the AWS SAM template. For more information, see Intrinsic Function Reference in the AWS CloudFormation User Guide. To copy the YAML required for nesting, in the Lambda console page for an AWS Serverless Application Repository application, choose Copy as SAM Resource. We invite you to fork the Event Fork Pipelines repository in GitHub and submit pull requests for contributing with new pipelines. In addition to event storage and backup, event search and analytics, and event replay, what other common event handling requirements have you seen? We look forward to seeing what you’ll come up with for extending the Event Fork Pipelines suite. Event Fork Pipelines is a serverless design pattern and a suite of open-source nested serverless applications, based on AWS SAM. You can deploy it directly from AWS Serverless Application Repository to enrich your event-driven system architecture. Event Fork Pipelines lets you store, back up, replay, search, and run analytics on the events flowing through your system. There’s no need to write code, manually stitch resources together, or set up infrastructure. You can deploy Event Fork Pipelines in any AWS Region that supports the underlying AWS services used in the pipelines. There are no additional costs associated with Event Fork Pipelines itself, and you pay only for using the AWS resources inside each nested application. Get started today by deploying the example ecommerce application or searching for Event Fork Pipelines in AWS Serverless Application Repository. AWS Cloud Map enables you to map your cloud. You can define friendly names for any resource, such as Amazon S3 buckets, Amazon DynamoDB tables, Amazon SQS queues, or custom cloud services built on Amazon EC2, Amazon ECS, Amazon EKS, or AWS Lambda. Your applications can then discover resource location and metadata by friendly name using the AWS SDK and authenticated API queries. Resources can be further filtered and discovered by custom attributes such as deployment stage or version. If you want an enterprise application component such as a database hosted on Amazon EC2 instances to provide an endpoint to your database service, you have to register your applications’ EC2 IP address with AWS Cloud Map. You could register additional metadata attributes, like INSTANCE_STATUS, and then use this attribute with AWS Cloud Map to identify when the service is READY so that querying applications can only attempt a connection when they see a READY status in AWS Cloud Map. In cases where different microservices or enterprise applications have endpoints that have to be discovered, you can use AWS Cloud Map to register those as well. Examples of such endpoints include types of ELB load balancers, including ELB Classic, Application Load Balancers (ALB), and Network Load Balancers (NLB) with Auto Scaling groups. Modern application architectures require a way to expose and advertise the service endpoint, register and de-register the endpoints, and query them. The dependencies of applications are expected to be handled by the applications themselves where a service registry becomes critical. Traditional workloads running on Amazon EC2 fronted by Auto Scaling groups or an ELB load balancer such as ELB Classic, Application Load Balancer, or Network Load Balancer. 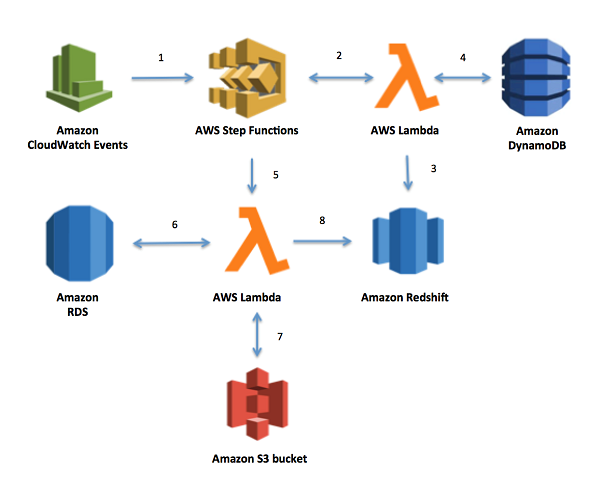 Amazon API Gateway and AWS Lambda for event-driven workflows. Container-based workloads on Amazon Elastic Container Service (ECS) using EC2 or Fargate launch types and Amazon Elastic Container Service for Kubernetes (EKS) for workloads that run as services (long-running) or daemons or run to completion (Batch / cron type). This image shows a typical enterprise application composed of components that run different architectures. There is a web server running on Amazon EKS, a backend on Amazon ECS, a serverless event registration service, and payments running on EC2 Auto Scaling groups (ASG) while leveraging databases on Amazon Relational Database Service (RDS). Let’s see how we can register each of these microservices (which are running on different cloud compute products) with AWS Cloud Map using both DNS-based and API-based service discovery and leveraging attributes for discovery when components are ready for traffic. AWS Cloud Map is a managed solution that lets you map logical names to the components/resources for an application. It allows applications to discover the resources using one of the AWS SDKs, RESTful API calls, or DNS queries. AWS Cloud Map serves registered resources, which can be Amazon DynamoDB tables, Amazon Simple Queue Service (SQS) queues, any higher-level application services that are built using EC2 instances or ECS tasks, or using a serverless stack. When you register a resource, you can specify attributes and clients that can use the attributes to filter which resources are to be returned. For example, an application can request resources in a particular deployment stage, like Gamma or Prod. Additionally, you can choose to enable health checking for your IP-based resources, ensuring that AWS Cloud Map returns only healthy endpoints. Each API call is authenticated, and developers can control access to service locations and configuration using AWS Identity and Access Management (IAM). This ensures that clients always discover the services that they’re authorized to use. Register instances with the service. Steps 1 and 2 are performed once for each service. A utility function for registration and de-registration of a microservice has to be created. This utility function can be invoked for microservices regardless of the compute stack choice and deployed through your CI/CD/DevOps processes. Step 3 is an ongoing operation that has to be updated each time the underlying EC2 compute that powers it changes. Examples include: EC2 Amazon Machine Image (AMI) changes, code changes for the service, and version changes. A namespace is a logical group of services that share the same domain name, such as example1.example.com or example2.example.com. If you want these namespaces to be queried from only within your VPC, opt for a private namespace. If you want them to be accessible over the Internet, create a public namespace. In our example, the public namespace could be example1, but the total count of use of items in example1 in a tracker/reporting service could be an internal service. When you register a service, AWS Cloud Map will create a record in the hosted zone – which is a combination of the name of the service and the name of the namespace. You could optionally define a health check for the service, too. If the service you are creating is meant for DNS-based discovery using one of the A, AAAA, or SRV records, then you can create your service using the following syntax. 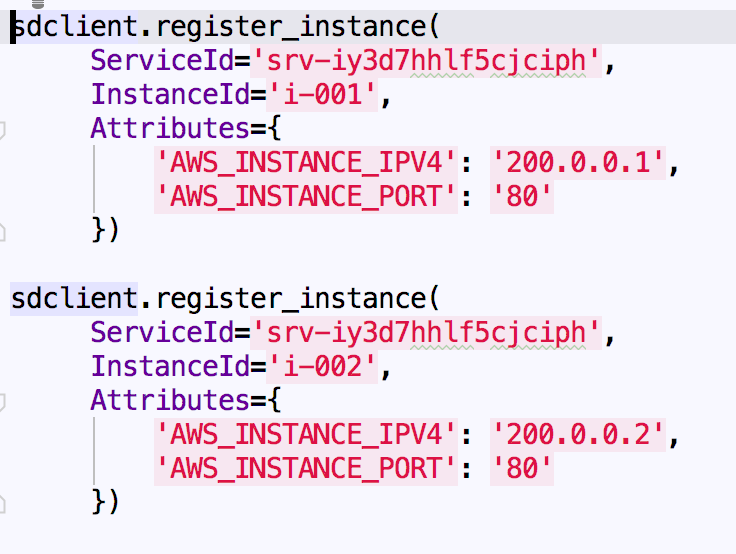 Examples of this could be your application code running on an EC2 instance or as a container (ECS/EKS). Amazon ECS is tightly integrated with AWS Cloud Map to enable service discovery for compute workloads running in ECS. When you enable service discovery for ECS services, it automatically keeps track of all task instances in AWS Cloud Map. Now your applications can discover them using DNS queries and AWS Cloud Map DiscoverInstances API calls. The ECS control plane that issues the calls would register the IP address of the task (and containers) with the AWS Cloud Map. When the task goes away – either because a newer version has been deployed or there is a crash or a restart – the ECS control plane handles the de-registration process as well. If you are using ECS for running containers, this is done seamlessly with ECS and AWS Cloud Map API integration. When you create a microservice with an API namespace, you could use any attributes you prefer, without providing the IP/port information. As the EC2 instances are coming online, the userdata section of the bootstrap configuration will issue commands to register the EC2 instance’s IP address with the service. An alternate approach would be to run a Lambda function that runs against a microservice’s Auto Scaling group, lists the IP addresses, and registers the instance against the service. If you are using an EC2 instance, if the instance is integrated with an Auto Scaling group, lifecycle hooks could also be used to run the de-register scripts. Another approach would be to use a Lambda function that runs periodically against an Auto Scaling group or even fires on Auto Scaling group notification events. Both DNS and API service discovery are now supported by the AWS Cloud Map service discovery. Supported DNS record types are – A, AAAA, SRV, and CNAME. It is typical in a microservices architecture for a service to be able to discover other services. We recommend that you query only by name and/or endpoint, and do not use the IP address of the compute stack (AWS Lambda / container/ EC2) that is backing the service. The API commands list_services and get_services provide the information on what services are available and their corresponding details. A DNS protocol also has clients caching the responses, so make sure that you handle caching settings. AWS Cloud Map uses regional endpoints here. Any A records created will use either a WEIGHTED response or MULTIVALUE answer policy. If you are using a Java-based compute stack, you might not want to choose DNS-based service discovery as the JVM caches DNS name lookups. When the JVM resolves a hostname to an IP address, it caches the IP address for a specified period of time, TTL. In such cases, you could use API-based service discovery and leverage the same approach as your other microservices that can use AWS Cloud Map. 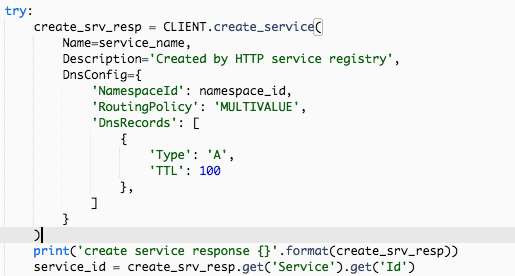 DiscoverInstances API discovers registered instances for a specified namespace and service using regional endpoints. Updates to your services, such as new instances registered or existing instances removed, will be available in the API faster than via DNS. The API provides the ability to decorate the resources with additional metadata (service attributes) that can be used during discovery. For example, get the services with attributes of blue or green or other application attributes. These attributes can be used to complement health checks while performing discovery (such as finding out whether the instance is ready or not). The idea is that as the container or EC2 instance comes online or goes offline, it needs to issue a call to the AWS Cloud Map API to register or de-register the compute IP address. Get started by visiting the AWS Cloud Map page. To learn more, take a look at the demo code in the GitHub repo here. If your compute workloads use EKS, please refer to this blog post that shows how to make EKS automatically publish all services in AWS Cloud Map. At AWS, we see our customers increasingly moving toward managed services to reduce the time and money that they spend managing infrastructure. This also applies to the messaging domain, where AWS provides a collection of managed services. Asynchronous messaging is a fundamental approach for integrating independent systems or building up a set of loosely coupled systems that can scale and evolve independently and flexibly. The well-known collection of enterprise integration patterns (EIPs) provides a “technology-independent vocabulary” to “design and document integration solutions.” This blog is the first of two that describes how you can implement the core EIPs using AWS messaging services. Let’s first look at the relevant AWS messaging services. When organizations migrate their traditional messaging and existing applications to the cloud gradually, they usually want to do it without rewriting their code. Amazon MQ is a managed message broker service for Apache ActiveMQ that makes it easy to set up and operate message brokers in the cloud. 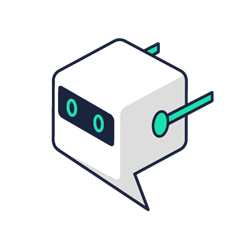 It supports industry-standard APIs and protocols such as JMS, AMQP, and MQTT, so you can switch from any standards-based message broker to Amazon MQ without rewriting the messaging code in your applications. Amazon MQ is recommended if you’re using messaging with existing applications and want to move your messaging to the cloud without rewriting existing code. However, if you build new applications for the cloud, we recommend that you consider using cloud-native messaging services such as Amazon SQS and Amazon SNS. These serverless, fully managed message queue and topic services scale to meet your demands and provide simple, easy-to-use APIs. You can use Amazon SQS and Amazon SNS to decouple and scale microservices, distributed systems, and serverless applications and improve overall reliability. This blog looks at the first part of some fundamental integration patterns. 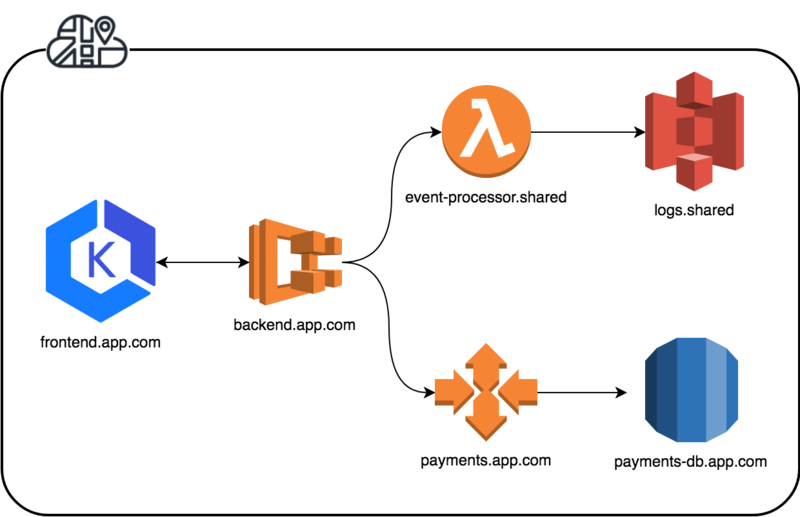 We describe the patterns and apply them to these AWS messaging services. This will help you apply the right pattern to your use case and architect for scale in a secure and cost-efficient manner. For all variants, we employ both traditional and cloud-native messaging services: Amazon MQ for the former and Amazon SQS and Amazon SNS for the latter. Let’s start with some fundamental integration patterns. First, we inspect the two major message exchange patterns: one-way and request-response. Applying one-way messaging, a message producer (sender) sends out a message to a messaging channel and doesn’t expect or want a response from whatever process (receiver) consumed the message. Examples of one-way messaging include a data transfer and a notification about an event that happened. With request-response messaging, a message producer (requester) sends out a message: for example, a command to instruct the responder to execute something. The requester expects a response from each message consumer (responder) who received that message, likely to know what the result of all executions was. To know where to send the response message to, the request message contains a return address that the responder uses. To make sure that the requester can assign an incoming response to a request, the requester adds a correlation identifier to the request, which the responders echo in their responses. Next, we look at the point-to-point messaging channel, one of the most important patterns for messaging channels. We will continue our consideration with publish-subscribe in our second post. A point-to-point channel is usually implemented by message queues. Message queues operate so that any given message is only consumed by one receiver, although multiple receivers can be connected to the queue. The queue ensures once-only consumption. Messages are usually buffered in queues so that they’re available for consumption for a certain amount of time, even if no receiver is currently connected. Point-to-point channels are often used for loosely coupled message transmission, though there are two other common uses. First, it can support horizontal scaling of message processing on the receiver side. Depending on the message load in the channel, the number of receiver processes can be elastically adjusted to cope with the load as needed. The queue acts as a buffering load balancer. Second, it can flatten peak loads of messages and prevent your receivers from being flooded when you can’t scale out fast enough or you don’t want additional scaling. In this section, we apply these fundamental patterns to AWS messaging services. The code examples are written in Java, but only by author preference. You can implement the same integration scenarios in C++, .NET, Node.js, Python, Ruby, Go, and other programming languages that AWS provides an SDK and an Apache Active MQ client library is available for. The diagrams in the following subsections show the principle of one-way messaging for point-to-point channels, using Amazon MQ queues and Amazon SQS queues. The sender produces a message and sends it into a queue, and the receiver consumes the message from the queue for processing. 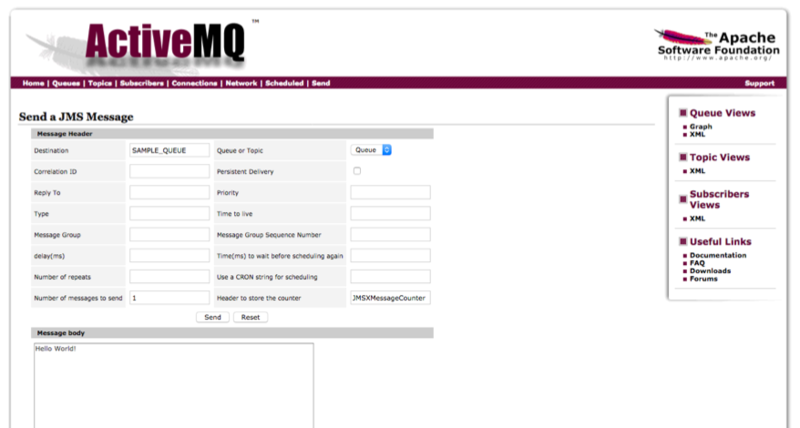 For traditional messaging (that is, Amazon MQ), the senders and consumers can use protocols such as JMS or AMQP. For cloud-native messaging, they can use the Amazon SQS API. To follow this example, open the Amazon MQ console and create a broker. In the following diagram we see the above explained components for the traditional messaging scenario: A sender sends messages into an Amazon MQ queue, a receiver consumes messages from that queue. In the following code example, sender and receiver are using the Apache Active MQ client library and the standard Java messaging service (JMS) API to send and receive messages to and from an Amazon MQ queue. You can run the code on every Amazon compute service, your on-premises data center, or your personal computer. For simplicity, the code launches sender and receiver in the same Java virtual machine (JVM). To follow this example, open the Amazon SQS console and create a standard SQS queue, using the queue name P2POneWayCloudNative. In the following diagram we see the above explained components for the cloud-native messaging scenario: A sender sends messages into an Amazon SQS queue, a receiver consumes messages from that queue. In the sample code below, the example sender is using the AWS SDK for Java to send messages to an Amazon SQS queue, running in an endless loop. You can run the code on every Amazon compute service, your on-premises data center, or your personal computer. We implement the receiver below in a serverless manner as an AWS Lambda function, using Amazon SQS as the event source. The name of the SQS queue is configured outside the function’s code, which is why it doesn’t appear in this code example. 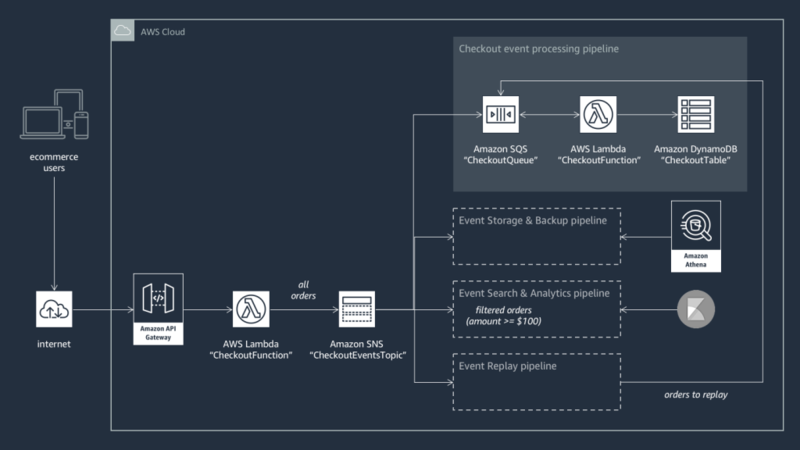 If this approach is new to you, you can find more details in AWS Lambda Adds Amazon Simple Queue Service to Supported Event Sources. Using Lambda comes with a number of benefits. For example, you don’t have to manage the compute environment for the receiver, and you can use an event (or push) model instead of having to poll for new messages. In addition to the one-way scenario, we have a return channel option. We would now call the involved processes rather than the requester and responder. The requester sends a message into the request queue, and the responder sends the response into the response queue. Remember that the requester enriches the message with a return address (the name of the response queue) so that the responder knows where to send the response to. The requester also sends a correlation ID that the responder copies into the response message so that the requester can match the incoming response with a request. In this example, we reuse the Amazon MQ broker that we set up earlier. In the following diagram we see the above explained components for the traditional messaging scenario, using an Amazon MQ queue each for the request messages and for the response messages. Using Amazon MQ, we don’t have to create queues explicitly because they’re implicitly created as needed when we start sending messages to them. This example is similar to the point-to-point one-way traditional example. Open the Amazon SQS console and create two standard SQS queues using the queue names P2PReqRespCloudNative and P2PReqRespCloudNative-Resp. In the following diagram we see the above explained components for the cloud-native scenario, using an Amazon SQS queue each for the request messages and for the response messages. The following example requester is almost identical to the point-to-point one-way cloud-native example sender. It also provides a reply-to address and a correlation ID. The following example responder is almost identical to the point-to-point one-way cloud-native example receiver. It also creates a message and sends it back to the reply-to address provided in the received message. We look forward to hearing about what you build and will continue innovating our services on your behalf. We have introduced the first fundamental EIPs and shown how you can apply them to the AWS messaging services. If you are keen to dive deeper, continue reading with the second part of this series, where we will cover publish-subscribe messaging. Amazon Simple Notification Service (Amazon SNS) is a fully managed pub/sub messaging service for decoupling event-driven microservices, distributed systems, and serverless applications. Enterprises around the world use Amazon SNS to support applications that handle private and sensitive data. Many of these enterprises operate in regulated markets, and their systems are subject to stringent security and compliance standards, such as HIPAA for healthcare, PCI DSS for finance, and FedRAMP for government. To address the requirements of highly critical workloads, Amazon SNS provides message encryption in transit, based on Amazon Trust Services (ATS) certificates, as well as message encryption at rest, using AWS Key Management Service (AWS KMS) keys. The Amazon SNS API is served through Secure HTTP (HTTPS) and encrypts all messages in transit with Transport Layer Security (TLS) certificates issued by ATS. These certificates verify the identity of the Amazon SNS API server whenever an encrypted connection is established. A certificate authority (CA) issues the certificate to a specific domain. Thus, when a domain presents a certificate issued by a trusted CA, the API client can determine that it’s safe to establish a connection. Amazon SNS supports encrypted topics. When you publish messages to encrypted topics, Amazon SNS uses customer master keys (CMK), powered by AWS KMS, to encrypt your messages. Amazon SNS supports customer-managed as well as AWS-managed CMKs. As soon as Amazon SNS receives your messages, the encryption takes place on the server, using a 256-bit AES-GCM algorithm. The messages are stored in encrypted form across multiple Availability Zones (AZs) for durability and are decrypted just before being delivered to subscribed endpoints, such as Amazon Simple Queue Service (Amazon SQS) queues, AWS Lambda functions, and HTTP and HTTPS webhooks. Amazon SNS encrypts only the body of the messages that you publish. It doesn’t encrypt message metadata (identifier, subject, timestamp, and attributes), topic metadata (name and attributes), or topic metrics. Thus, encryption doesn’t affect the operations of Amazon SNS, such as message fanout and message filtering. Amazon SNS doesn’t retroactively encrypt messages that were published before server-side encryption (SSE) was enabled for the topic. In addition, any encrypted message retains its encryption even if you disable the encryption of its topic. It can take up to a minute for encryption to be effective after enabled. Amazon SNS uses envelope encryption internally. It uses your configured CMK to generate a short-lived data encryption key (DEK) and then reuses this DEK to encrypt your published messages for 5 minutes. When the DEK expires, Amazon SNS automatically rotates to generate a new DEK from AWS KMS. You can use encrypted topics for a variety of scenarios, especially for processing sensitive data, such as personally identifiable information (PII) and protected health information (PHI). The following example illustrates an electronic medical record (EMR) system deployed in several clinics and hospitals. The system manages patients’ medical histories, diagnoses, medications, immunizations, visits, lab results, and doctors’ notes. The Billing system manages the clinic’s revenue cycles and processes accounts receivable and reimbursements. The Scheduling system keeps patients informed of their upcoming clinic and lab appointments and reminds them to take their medications. The Prescription system transmits electronic prescriptions to authorized pharmacies and tracks medication-filling history. When a physician inputs a new record into a patient’s file, the EMR system publishes a message to an Amazon SNS topic. The topic in turn fans out a copy of the message to each one of the three subscribing Amazon SQS queues for parallel processing. When the message is retrieved from the queue, the Billing system invoices the patient, the Scheduling system books the patient’s next clinic or lab appointment, and the Prescription system orders the required medication from an authorized pharmacy. The Amazon SNS topic and all Amazon SQS queues described in this use case are encrypted using AWS KMS keys that the clinic creates. The communication among services is based on HTTPS API calls. This end-to-end encryption protects patients’ medical records by making their content unavailable to unauthorized or anonymous users while messages are either in transit or at rest. You can create an Amazon SNS encrypted topic or an Amazon SQS encrypted queue by setting its attribute KmsMasterKeyId, which expects an AWS KMS key identifier. The key identifier can be a key ID, key ARN, or key alias. You can use the identifier of either a customer-managed CMK, such as alias/MyKey, or the AWS-managed CMK in your account, whose alias is alias/aws/sns. The following code snippets work with the AWS SDK for Java. You can use these code samples for the healthcare system scenario in the previous section. First, the principal publishing messages to the Amazon SNS encrypted topic must have access permission to execute the AWS KMS operations GenerateDataKey and Decrypt, in addition to the Amazon SNS operation Publish. The principal can be either an IAM user or an IAM role. The following IAM policy grants the required access permission to the principal. If you want to use a customer-managed CMK, a CMK needs to be created and secured by granting the publisher access to the same AWS KMS operations GenerateDataKey and Decrypt. The access permission is granted using KMS key policies. The following JSON document shows an example policy statement for the customer-managed CMK used by the healthcare system. For more information on creating and securing keys, see Creating Keys and Using Key Policies in the AWS Key Management Service Developer Guide. The following snippet uses the CMK to create an encrypted topic, three encrypted queues, and their corresponding subscriptions. Next, the following code composes a JSON message and publishes it to the encrypted topic. Publishing messages to encrypted topics isn’t different from publishing messages to standard, unencrypted topics. Your publisher needs access to perform AWS KMS operations GenerateDataKey and Decrypt on the configured CMK. All of the encryption logic is offloaded to Amazon SNS, and the message is delivered to all subscribed endpoints. A copy of the message is now available in each subscribing queue. The final code snippet retrieves the messages from the encrypted queues. Retrieving messages from encrypted queues isn’t different from retrieving messages from standard, unencrypted queues. All of the decryption logic is offloaded to Amazon SQS. Several AWS services publish events to Amazon SNS topics. To allow these event sources to work with encrypted topics, you must first create a customer-managed CMK and then add the following statement to the policy of the CMK. Once the CMK key policy has been configured, you can enable encryption on the topic using the CMK, and then provide the encrypted topic’s ARN to the event source. As of November 2018, Amazon CloudWatch alarms don’t yet work with Amazon SNS encrypted topics. For information on publishing alarms to standard, unencrypted topics, see Using Amazon CloudWatch Alarms in the Amazon CloudWatch User Guide. In addition to encrypting messages in transit and at rest, you can further harden the security and privacy of your applications by publishing messages to encrypted topics privately, without traversing the public Internet. 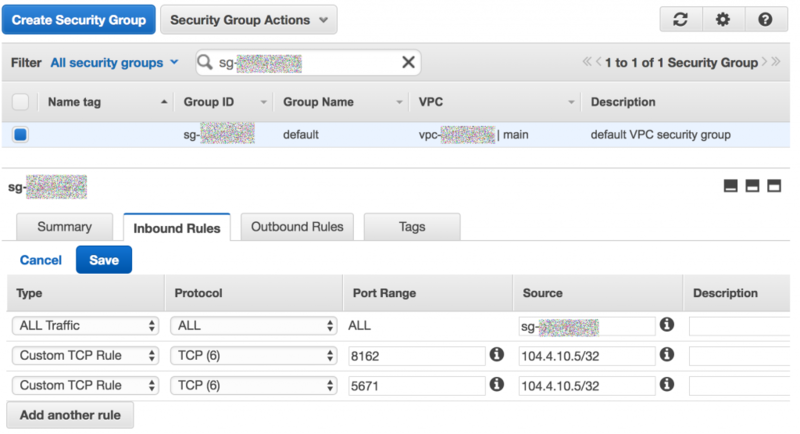 Amazon SNS supports VPC endpoints via AWS PrivateLink. You can use VPC endpoints to privately publish messages to both standard and encrypted topics from a virtual private cloud (VPC) subnet. When you use AWS PrivateLink, you don’t have to set up an internet gateway, network address translation (NAT) device, or virtual private network (VPN) connection. For more information, see Publishing to Amazon SNS topics from Amazon Virtual Private Cloud in the Amazon Simple Notification Service Developer Guide. You can use AWS CloudTrail to audit the usage of the AWS KMS keys applied to your Amazon SNS topics. AWS CloudTrail creates log files that contain a history of AWS API calls and related events for your account. These log files include all AWS KMS API requests made with the AWS Management Console , SDKs, and Command Line Tools, as well as those made through integrated AWS services. You can use these log files to get information about when your CMK was used, the operation that was requested, the identity of the requester, and the IP address that the request came from. For more information, see Logging AWS KMS API calls with AWS CloudTrail in the AWS Key Management Service Developer Guide. Amazon SNS provides a full set of security features to protect your data from unauthorized and anonymous access, including message encryption in transit with Amazon ATS certificates, message encryption at rest with AWS KMS keys, message privacy with AWS PrivateLink, and auditing with AWS CloudTrail. Moreover, you can subscribe Amazon SQS encrypted queues to Amazon SNS encrypted topics to establish end-to-end encryption in your messaging use cases. Amazon SNS encrypted topics are available in all AWS Regions where AWS KMS is available. For pricing details, see AWS KMS pricing and Amazon SNS pricing. There is no increase in Amazon SNS charges for using encrypted topics, beyond the AWS KMS request charges incurred. For more information, see Protecting Amazon SNS Data Using Server-Side Encryption (SSE) in the Amazon Simple Notification Service Developer Guide. Get started today by creating your Amazon SNS encrypted topics via the AWS Management Console and AWS SDKs. 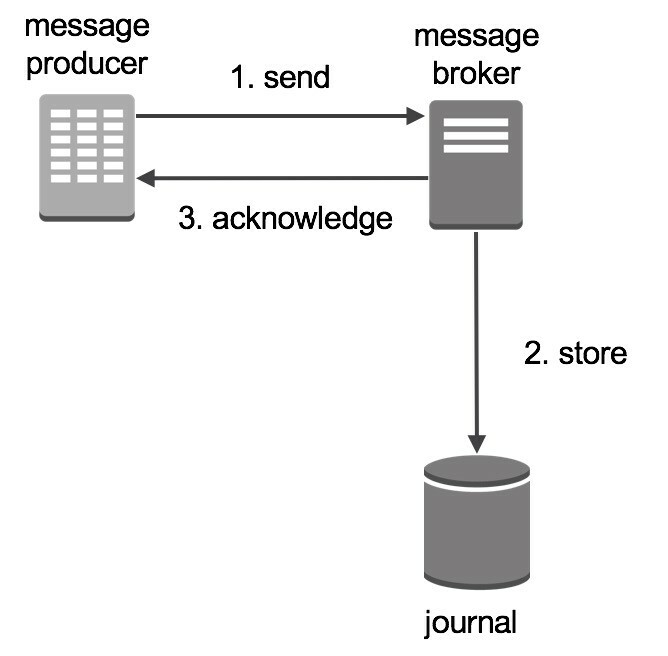 Many organizations, particularly enterprises, rely on message brokers to connect and coordinate different systems. Message brokers enable distributed applications to communicate with one another, serving as the technological backbone for their IT environment, and ultimately their business services. Applications depend on messaging to work. In many cases, those organizations have started to build new or “lift and shift” applications to AWS. In some cases, there are applications, such as mainframe systems, too costly to migrate. In these scenarios, those on-premises applications still need to interact with cloud-based components. Amazon MQ is a managed message broker service for ActiveMQ that enables organizations to send messages between applications in the cloud and on-premises to enable hybrid environments and application modernization. For example, you can invoke AWS Lambda from queues and topics managed by Amazon MQ brokers to integrate legacy systems with serverless architectures. ActiveMQ is an open-source message broker written in Java that is packaged with clients in multiple languages, Java Message Server (JMS) client being one example. This post shows you can use Amazon MQ to integrate on-premises and cloud environments using the network of brokers feature of ActiveMQ. 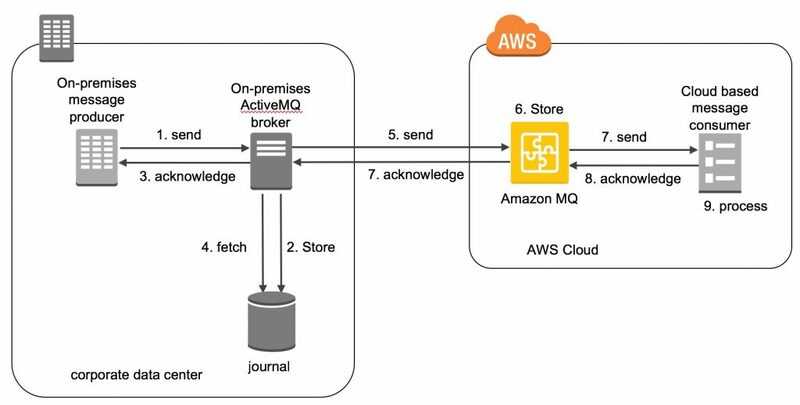 It provides configuration parameters for a one-way duplex connection for the flow of messages from an on-premises ActiveMQ message broker to Amazon MQ. First, look at queues within ActiveMQ and then at the network of brokers as a mechanism to distribute messages. The network of brokers behaves differently from models such as physical networks. 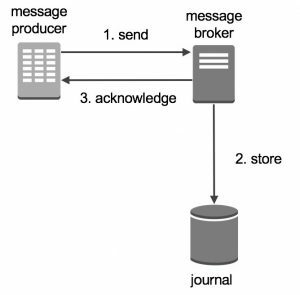 The key consideration is that the production (sending) of a message is disconnected from the consumption of that message. Think of the delivery of a parcel: The parcel is sent by the supplier (producer) to the end customer (consumer). The path it took to get there is of little concern to the customer, as long as it receives the package. The same logic can be applied to the network of brokers. Here’s how you build the flow from a simple message to a queue and build toward a network of brokers. Before you look at setting up a hybrid connection, I discuss how a broker processes messages in a simple scenario. A message is sent to a queue from the producer. The broker persists this in its store or journal. At this point, an acknowledgement (ACK) is sent to the producer from the broker. The message listener (consumer) calls the broker, which creates a subscription to the queue. Messages are fetched from the message store and sent to the consumer. The consumer acknowledges that the message has been received before processing it. Upon receiving the ACK, the broker sets the message as having been consumed. By default, this deletes it from the queue. You can set the consumer to ACK after processing by setting up transaction management or handle it manually using Session.CLIENT_ACKNOWLEDGE. I now introduce the concept of static propagation with the network of brokers as the mechanism for message transfer from on-premises brokers to Amazon MQ. Static propagation refers to message propagation that occurs in the absence of subscription information. In this case, the objective is to transfer messages arriving at your selected on-premises broker to the Amazon MQ broker for consumption within the cloud environment. The on-premises broker receives a message from a producer for a specific queue. The on-premises broker sends (statically propagates) the message to the Amazon MQ broker. The Amazon MQ broker sends an acknowledgement to the on-premises broker, which marks the message as having been consumed. Amazon MQ holds the message in its queue ready for consumption. A consumer connects to Amazon MQ broker, subscribes to the queue in which the message resides, and receives the message. Amazon MQ broker marks the message as having been consumed. The first step is creating an Amazon MQ broker. 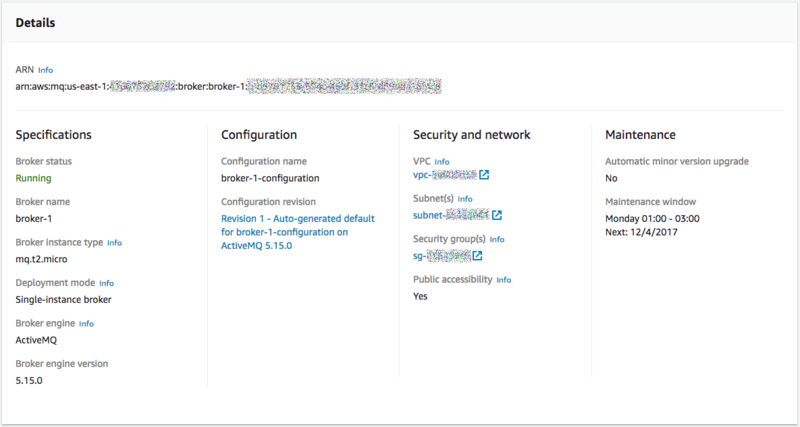 Sign in to the Amazon MQ console and launch a new Amazon MQ broker. Name your broker and choose Next step. Scroll down and enter your user name and password. For VPC, Subnet, and Security Group, pick the values for the resources in which your broker will reside. For Public Accessibility, choose Yes, as connectivity is internet-based. Another option would be to use private connectivity between your on-premises network and the VPC, an example being an AWS Direct Connect or VPN connection. In that case, you could set Public Accessibility to No. For Maintenance, leave the default value, No preference. Choose Create Broker. Wait several minutes for the broker to be created. After creation is complete, you see your broker listed. For connectivity to work, you must configure the security group where Amazon MQ resides. For this post, I focus on the OpenWire protocol. This is the first configuration item required to enable a network of brokers. It is only required on the on-premises broker, which initiates and creates the connection with Amazon MQ. 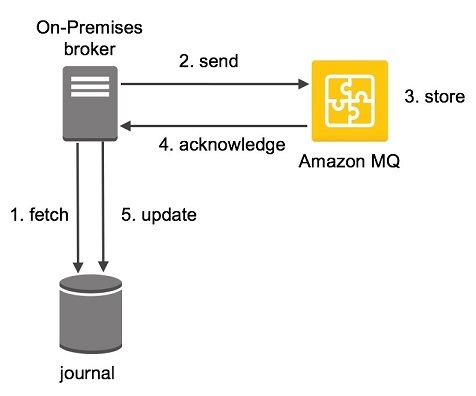 This connection, after it’s established, enables the flow of messages in either direction between the on-premises broker and Amazon MQ. The focus of this post is the uni-directional flow of messages from the on-premises broker to Amazon MQ. name="Q:source broker name->target broker name"
The highlighted components are the most important elements when configuring your on-premises broker. That this connection relates to an ActiveMQ queue (Q) as opposed to a topic (T), for reference purposes. The source broker and target broker. duplex –Setting this to false ensures that messages traverse uni-directionally from the on-premises broker to Amazon MQ. uri –Specifies the remote endpoint to which to connect for message transfer. In this case, it is an Openwire endpoint on your Amazon MQ broker. This information could be obtained from the Amazon MQ console or via the API. username and password – The same username and password configured when creating the Amazon MQ broker, and used to access the Amazon MQ ActiveMQ console. networkTTL – Number of brokers in the network through which messages and subscriptions can pass. Leave this setting at the current value, if it is already included in your broker connection. staticallyIncludedDestinations > queue physicalName – The destination ActiveMQ queue for which messages are destined. This is the queue that is propagated from the on-premises broker to the Amazon MQ broker for message consumption. After the network connector is configured, you must restart the ActiveMQ service on the on-premises broker for the changes to be applied. There are a number of places within the ActiveMQ console of your on-premises and Amazon MQ brokers to browse to verify that the configuration is correct and the connection has been established. 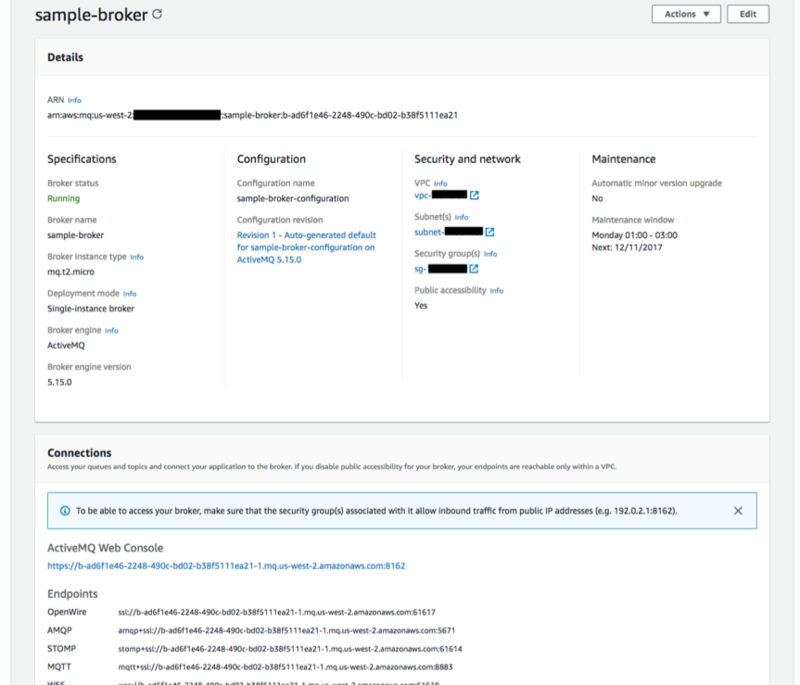 This identifies that the connection between your on-premises broker and your Amazon MQ broker is up and running. If you configured the uri: for AMQP, STOMP, MQTT, or WSS as opposed to Openwire, you would see this connection under the corresponding section of the Connections page. The setup described outlines a way for messages produced on premises to be propagated to the cloud for consumption in the cloud. This section provides steps on verifying the message flow. After you specify this queue name as staticallyIncludedDestinations > queue physicalName: and your ActiveMQ service starts, you see the following on your on-premises ActiveMQ console Queues page. As you can see, no messages have been sent but you have one consumer listed. If you then choose Active Consumers under the Views column, you see Active Consumers for TestingQ. This is telling you that your Amazon MQ broker is a consumer of your on-premises broker for the testing queue. What this means is that the message originating from the on-premises producer has traversed the on-premises broker and propagated immediately to the Amazon MQ broker. At this point, the message is no longer available for consumption from the on-premises broker. This means that the message originally sent to your on-premises broker has traversed the network of brokers unidirectional network bridge, and is ready to be consumed from your Amazon MQ broker. The indicator is the Number of Pending Messages column. As you can see, the Number of Pending Messages column figure has changed to 0 as that message has been consumed. This diagram outlines the message lifecycle from the on-premises producer to the on-premises broker, traversing the hybrid connection between the on-premises broker and Amazon MQ, and finally consumption within the AWS Cloud. This post focused on an ActiveMQ-specific scenario for transferring messages within an ActiveMQ queue from an on-premises broker to Amazon MQ. For other on-premises brokers, such as IBM MQ, another approach would be to run ActiveMQ on-premises broker and use JMS bridging to IBM MQ, while using the approach in this post to forward to Amazon MQ. Yet another approach would be to use Apache Camel for more sophisticated routing. I hope that you have found this example of hybrid messaging between an on-premises environment in the AWS Cloud to be useful. Many customers are already using on-premises ActiveMQ brokers, and this is a great use case to enable hybrid cloud scenarios. To learn more, see the Amazon MQ website and Developer Guide. 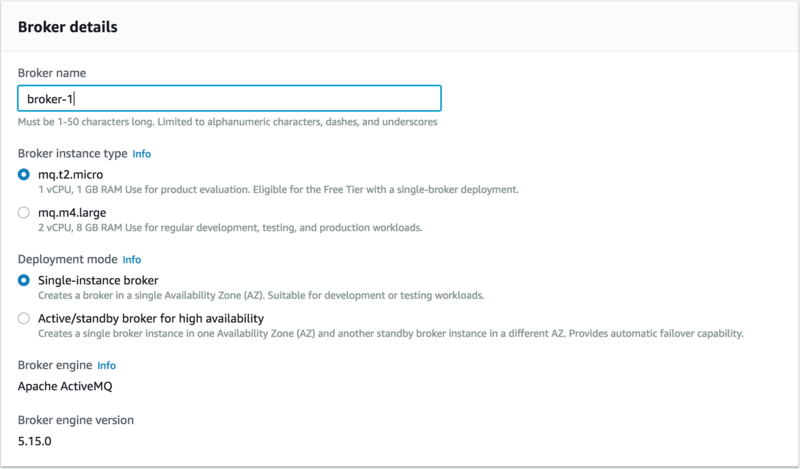 You can try Amazon MQ for free with the AWS Free Tier, which includes up to 750 hours of a single-instance mq.t2.micro broker and up to 1 GB of storage per month for one year. Message brokers can be used to solve a number of needs in enterprise architectures, including managing workload queues and broadcasting messages to a number of subscribers. Amazon MQ is a managed message broker service for Apache ActiveMQ that makes it easy to set up and operate message brokers in the cloud. 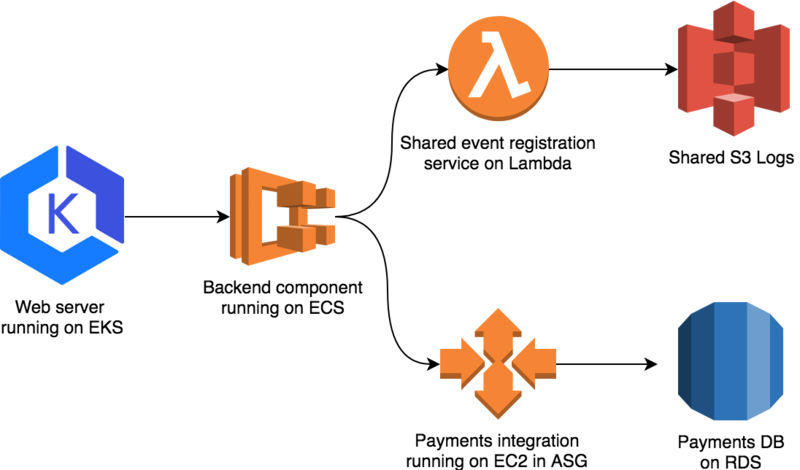 In this post, I discuss one approach to invoking AWS Lambda from queues and topics managed by Amazon MQ brokers. This and other similar patterns can be useful in integrating legacy systems with serverless architectures. You could also integrate systems already migrated to the cloud that use common APIs such as JMS. For example, imagine that you work for a company that produces training videos and which recently migrated its video management system to AWS. The on-premises system used to publish a message to an ActiveMQ broker when a video was ready for processing by an on-premises transcoder. However, on AWS, your company uses Amazon Elastic Transcoder. Instead of modifying the management system, Lambda polls the broker for new messages and starts a new Elastic Transcoder job. This approach avoids changes to the existing application while refactoring the workload to leverage cloud-native components. This solution uses Amazon CloudWatch Events to trigger a Lambda function that polls the Amazon MQ broker for messages. Instead of starting an Elastic Transcoder job, the sample writes the received message to an Amazon DynamoDB table with a time stamp indicating the time received. To start, navigate to the Amazon MQ console. Next, launch a new Amazon MQ instance, selecting Single-instance Broker and supplying a broker name, user name, and password. Be sure to document the user name and password for later. For the purposes of this sample, choose the default options in the Advanced settings section. Your new broker is deployed to the default VPC in the selected AWS Region with the default security group. For this post, you update the security group to allow access for your sample Lambda function. In a production scenario, I recommend deploying both the Lambda function and your Amazon MQ broker in your own VPC. You should also modify the Security Group for the broker by clicking on its Security Group ID. Click the Edit button and then click Add Rule to allow inbound traffic on port 8162 for your IP address. To simplify the deployment of this example, I’ve provided an AWS Serverless Application Model (SAM) template that deploys the sample function and DynamoDB table, and schedules the function to be invoked every five minutes. Detailed instructions can be found with sample code on GitHub in the amazonmq-invoke-aws-lambda repository, with sample code. I discuss a few key aspects in this post. In the code, you include the URI, user name, and password for your newly created Amazon MQ broker. These allow the function to poll the broker for new messages on the sample queue. The sample Lambda function is written in Node.js, but clients exist for a number of programming languages. For the purpose of this example, use the Amazon MQ console to send a test message. Navigate to the details page for your broker. About midway down the page, choose ActiveMQ Web Console. 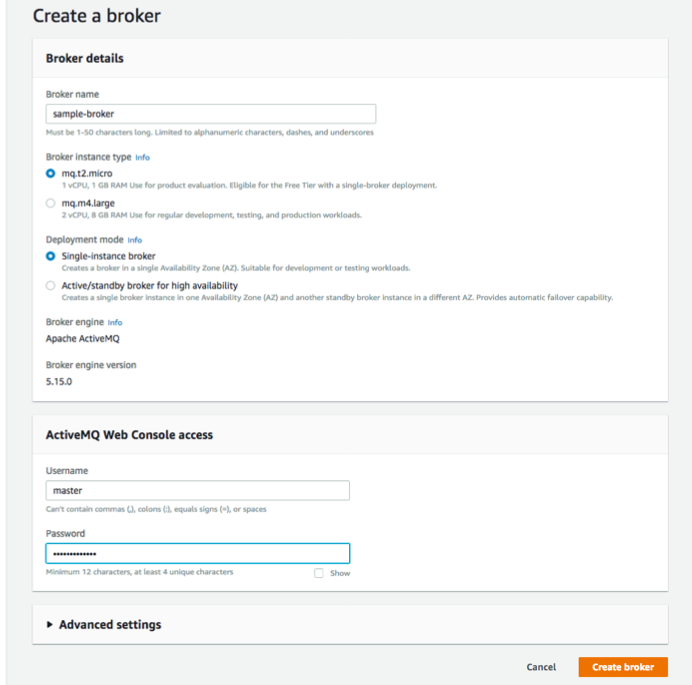 Next, choose Manage ActiveMQ Broker to launch the admin console. When you are prompted for a user name and password, use the credentials created earlier. At the top of the page, choose Send. From here, you can send a sample message from the broker to subscribers. For this example, this is how you generate traffic to test the end-to-end system. Be sure to set the Destination value to “SAMPLE_QUEUE.” The message body can contain any text. Choose Send. You now have a Lambda function polling for messages on the broker. To verify that your function is working, you can confirm in the DynamoDB console that the message was successfully received and processed by the sample Lambda function. If there is no message in DynamoDB, check again in a few minutes or review the CloudWatch Logs group for Lambda functions that contain debug messages. Beyond the approach described here, you may consider other approaches as well. For example, you could use an intermediary system such as Apache Flume to pass messages from the broker to Lambda or deploy Apache Camel to trigger Lambda via a POST to API Gateway. There are trade-offs to each of these approaches. My goal in using CloudWatch Events was to introduce an easily repeatable pattern familiar to many Lambda developers. I hope that you have found this example of how to integrate AWS Lambda with Amazon MQ useful. If you have expertise or legacy systems that leverage APIs such as JMS, you may find this useful as you incorporate serverless concepts in your enterprise architectures. Data processing and transformation is a common use case you see in our customer case studies and success stories. Often, customers deal with complex data from a variety of sources that needs to be transformed and customized through a series of steps to make it useful to different systems and stakeholders. This can be difficult due to the ever-increasing volume, velocity, and variety of data. Today, data management challenges cannot be solved with traditional databases. Workflow automation helps you build solutions that are repeatable, scalable, and reliable. You can use AWS Step Functions for this. A great example is how SGK used Step Functions to automate the ETL processes for their client. With Step Functions, SGK has been able to automate changes within the data management system, substantially reducing the time required for data processing. In this post, SGK shares the details of how they used Step Functions to build a robust data processing system based on highly configurable business transformation rules for ETL processes. SGK is a subsidiary of Matthews International Corporation, a diversified organization focusing on brand solutions and industrial technologies. SGK’s Global Content Creation Studio network creates compelling content and solutions that connect brands and products to consumers through multiple assets including photography, video, and copywriting. We were recently contracted to build a sophisticated and scalable data management system for one of our clients. We chose to build the solution on AWS to leverage advanced, managed services that help to improve the speed and agility of development. Ingesting a large amount of complex data to facilitate both reporting and product funding decisions for the client’s global marketing and supply chain organizations. Processing the data through normalization and applying complex algorithms and data transformations. The system goal was to provide information in the relevant context—such as strategic marketing, supply chain, product planning, etc. —to the end consumer through automated data feeds or updates to existing ETL systems. Output data that needed to be refreshed at least twice a day to provide fresh datasets to both local and global markets. That constant data refresh posed several challenges, especially around data management and replication across multiple databases. The complexity of reporting business rules that needed to be updated on a constant basis. Data that could not be processed as contiguous blocks of typical time-series data. The measurement of the data was done across seasons (that is, combination of dates), which often resulted with up to three overlapping seasons at any given time. Input data that came from 10+ different data sources. Each data source ranged from 1–20K rows with as many as 85 columns per input source. These challenges meant that our small Dev team heavily invested time in frequent configuration changes to the system and data integrity verification to make sure that everything was operating properly. Maintaining this system proved to be a daunting task and that’s when we turned to Step Functions—along with other AWS services—to automate our ETL processes. AWS Step Functions: Before Step Functions was available, we were using multiple Lambda functions for this use case and running into memory limit issues. With Step Functions, we can execute steps in parallel simultaneously, in a cost-efficient manner, without running into memory limitations. AWS Lambda: The Step Functions state machine uses Lambda functions to implement the Task states. Our Lambda functions are implemented in Java 8. Amazon DynamoDB provides us with an easy and flexible way to manage business rules. We specify our rules as Keys. These are key-value pairs stored in a DynamoDB table. Amazon RDS: Our ETL pipelines consume source data from our RDS MySQL database. Amazon Redshift: We use Amazon Redshift for reporting purposes because it integrates with our BI tools. Currently we are using Tableau for reporting which integrates well with Amazon Redshift. Amazon S3: We store our raw input files and intermediate results in S3 buckets. Amazon CloudWatch Events: Our users expect results at a specific time. We use CloudWatch Events to trigger Step Functions on an automated schedule. A rule in CloudWatch Events triggers the state machine execution on an automated schedule. The state machine invokes the first Lambda function. The Lambda function deletes all existing records in Amazon Redshift. Depending on the dataset, the Lambda function can create a new table in Amazon Redshift to hold the data. The same Lambda function then retrieves Keys from a DynamoDB table. Keys represent specific marketing campaigns or seasons and map to specific records in RDS. The state machine executes the second Lambda function using the Keys from DynamoDB. The second Lambda function retrieves the referenced dataset from RDS. The records retrieved represent the entire dataset needed for a specific marketing campaign. The second Lambda function executes in parallel for each Key retrieved from DynamoDB and stores the output in CSV format temporarily in S3. Finally, the Lambda function uploads the data into Amazon Redshift. To understand the above data processing workflow, take a closer look at the Step Functions state machine for this example. We walk you through the state machine in more detail in the following sections. In this example, the cron expression invokes the Step Functions state machine at 3:00am and 2:00pm (UTC) every day. We use DynamoDB to store Keys that determine which rows of data to extract from our RDS MySQL database. An example Key is MCS2017, which stands for, Marketing Campaign Spring 2017. Each campaign has a specific start and end date and the corresponding dataset is stored in RDS MySQL. A record in RDS contains about 600 columns, and each Key can represent up to 20K records. A given day can have multiple campaigns with different start and end dates running simultaneously. In the following example DynamoDB item, three campaigns are specified for the given date. 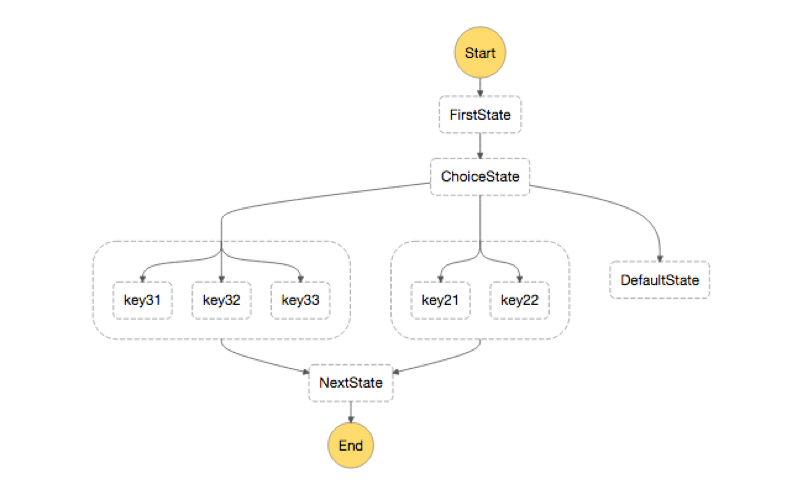 The state machine example shown above uses Keys 31, 32, and 33 in the first ChoiceState and Keys 21 and 22 in the second ChoiceState. These keys represent marketing campaigns for a given day. For example, on Monday, there are only two campaigns requested. The ChoiceState with Keys 21 and 22 is executed. If three campaigns are requested on Tuesday, for example, then ChoiceState with Keys 31, 32, and 33 is executed. MCS2017 can be represented by Key 21 and Key 33 on Monday and Tuesday, respectively. This approach gives us the flexibility to add or remove campaigns dynamically. The following JSON represents ChoiceState. The variable $.keyT represents the number of keys retrieved from DynamoDB. This variable determines which of the parallel branches should be executed. At the time of publication, Step Functions does not support dynamic parallel state. Therefore, choices under ChoiceState are manually created and assigned hardcoded StringEquals values. These values represent the number of parallel executions for the second Lambda function. The second Lambda function in the state machine extracts records from RDS associated with keys retrieved for DynamoDB. It processes the data then loads into an Amazon Redshift table. The following is code snippet for the second Lambda function in Java 8. After the data is loaded into Amazon Redshift, end users can visualize it using their preferred business intelligence tools. At the time of publication, the 1.5–GB memory hard limit for Lambda functions was inadequate for processing our complex workload. Step Functions gave us the flexibility to chunk our large datasets and process them in parallel, saving on costs and time. In our previous implementation, we assigned each key a dedicated Lambda function along with CloudWatch rules for schedule automation. This approach proved to be inefficient and quickly became an operational burden. Previously, we processed each key sequentially, with each key adding about five minutes to the overall processing time. For example, processing three keys meant that the total processing time was three times longer. With Step Functions, the entire state machine executes in about five minutes. Using DynamoDB with Step Functions gave us the flexibility to manage keys efficiently. In our previous implementations, keys were hardcoded in Lambda functions, which became difficult to manage due to frequent updates. DynamoDB is a great way to store dynamic data that changes frequently, and it works perfectly with our serverless architectures. With Step Functions, we were able to fully automate the frequent configuration updates to our dataset resulting in significant cost savings, reduced risk to data errors due to system downtime, and more time for us to focus on new product development rather than support related issues. We hope that you have found the information useful and that it can serve as a jump-start to building your own ETL processes on AWS with managed AWS services. For more information about how Step Functions makes it easy to coordinate the components of distributed applications and microservices in any workflow, see the use case examples and then build your first state machine in under five minutes in the Step Functions console.